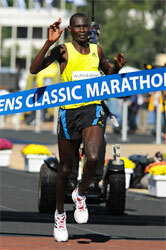 Gilbert Chepkwony running his second marathon, won the 87th edition of Europe's oldest Marathon. His winning time was a course record and a personal best, while second and third placed Solomon Bushendich and Peter Chebet also dipped under 2:09. The previous record was 2:09:53 by William Biama in 2007. The race was held in near perfect conditions, with temperatures of 9-12°C, sun and only slight wind as 30,000 spectators lined the streets along the two-lap course. Bushendich won a close battle for second ahead of Chebet, as both set personal bests by a dew seconds. The pace started conservatively with 1:04:58 through the first half led by pacemakers Elisha Meli with Paul Kimugul, who ended their duties at 30km. The pace picked up in the second half (1:03:33). 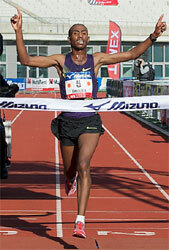 Chepkwony earned 15,000 Euros for the victory, including his course record bonus. Debutant Kipkoech Ruto was fourth while the Slovak national title went to Imrich Pastor, in seventh, for the fifth consecutive time. In the women's race, the splits were the reverse. Twenty-eight year-old Ethiopian Almaz Alemu Balcha, running in her fifth Marathon, opened with a fast 1:13:56 first half. She faded considerably over the waning stages but still won comfortably in 2:36:35 (second half 1:22:37). "I did not have training for such a fast pace," said Balcha, who earned 6000 Euros for the victory. "After the 24km I started cramping and was slower and slower. I was not worried about first place, but wanted a better time." A record number of 5500 runners participated in all the races. In the Baxters River Ness 10K Artur Kern of Poland beat last year's winner Likas Wambua. 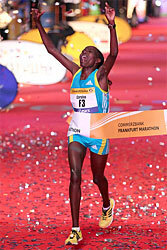 First woman home was course record holder Cathy Mutwa of Kenya. The HSPC Gerald Cooper Memorial Cup and a donation of £1000 to the charity of their choice, awarded to the first person resident in the Highland area to cross the finish line in the Marathon, was won by Hugh Campbell of Isle of Skye. Over 8,600 runners from 41 countries entered the Festival of Running, including Britain's most scenic marathon. The mild, damp start to the day didn't dampen the runners' enthusiasm for an event which welcomes participants of all ages and abilities to the Baxters Loch Ness Marathon, River Ness 10K, 10k Corporate Challenge, River Ness 5k, and, new for this year, the Wee Nessie. Malcolm Sutherland of Baxters Loch Ness Marathon & Festival of Running said: “We offer one of the most friendly and most scenic marathons which has helped us to attract a growing number of runners from all corners of the globe”. Runners participating in last year's event generated over £660,000 for charity, and brought benefit of over £2,178,066 to the local area. Cloudy, damp conditions greeted 14,078 participants in today's 31st edition. There were 3221 marathon participants, 6800 in the Half and 3184 in the 8km race. The kids' run, of 1200m, had 875 entries. A new world age-group record was set in the Women's Marathon. Philip Samoei beat pre-race favourite James Lander. Lander, who recently moved to Victoria from the US, said: "I was pleased overall, but it was the windiest race I have ever run." Those conditions affected the women's race as well, which Cheryl Murphy led at halfway but then dropped out to leave Catrin Jones as winner, 90 seconds ahead of three-time Marathon winner, Suzanne Evans. The Marathon saw a world record shattered with Gwen McFarlan winning the F75-79 category in 4:02:27, 47 minutes faster than the previous record for a 76-year old. There were more finishers than ever in the Half Marathon and the 8km Road Race — 5,696 and 2,678 respectively. The Marathon saw 2,558 finishers, with the overall total standing at a record 11,807 — 13% up on 2009. The 32nd GoodLife Fitness Victoria Marathon will be on 9 October 2011. 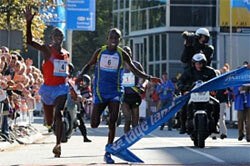 An extraordinary race and a perfect day for running allowed 32-year-old Kenyan Paul Kosgei to break the course record. His 2:09:00 surpassed Haron Toroitich's 2004 mark by nine seconds and improved his personal best by 15 seconds. World Champion at Half Marathon in 2002, Kosgei launched an attack at 39km to drop Dickson Chumba and Abdullah Dawit Shami, both of whom recorded big improvements to their personal bests. 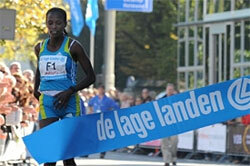 The women also ran fast, with 25-year-old Kenyan Hellen Mugo Wanjiku on 1:10:14 at halfway. She eventually slowed but still finished with an excellent 2:27:16, a personal best by 12 seconds and ranking her third among best-ever times at Carpi. Maria Guida kept her 2:25:57 course record from 1999. In a surprise second place 30-year-old Lithuanian Diana Lobacevske closed up in the later stages and shaved seven seconds from her personal best. With its sprawling parks and tree-lined streets and boulevards, Nanning is known as China's Green City. Fittingly and from the outset, the battle at the front featured the various shades of green found on the Kenyan and Ethiopian team vests. The city provided hothouse conditions, with the women facing 69% humidity at the start and temperatures that climbed rapidly from under 20°C to well over it. The men, starting later, had slightly reduced humidity but a slightly higher temperature. Florence Kiplagat kicked away from Dire Tune over the final 800m to capture an impressive victory. Running in just her second Half Marathon, the 23-year-old Kenyan clocked 1:08:24 in hot and humid conditions to collect her second global title, adding to her triumph at the 2009 World Cross Country Championships. She had made her Half Marathon debut only a month ago, running 1:07:40 in Lille, France. “I wasn't worried about the time,” she said, noting the humid conditions. Kiplagat's victory propelled Kenya to their fourth team title in five years. After a fierce contest the 2008 winners Ethiopia had to settle for a fourth silver medal finish in the past five editions. After a kilometre four Kenyans – Kiplagat, Peninah Arusei, Sarah Chepchirchir, and Joyce Chepkirui – were just a stride ahead of all five of Ethiopia's entrants: Dire Tune, Feyse Tadese, Fate Tola, Abebech Afework, and Meseret Mengistu. A kilometre later the only runner in the lead pack not hailing from east Africa was Nikki Chapple of Australia. The leading ten charged though the first 5km in 15:53, only the fourth time in these championships that the opening split has been under 16 minutes. The only change over the next 3km, as the leaders passed the 12 Pillars of the impressive Guangxi People's Hall, came at the back, with Chapple dropping off the pace and forced into a no man's land, some 20 seconds ahead of the chase pack. The pace slowed as the temperature rose with 10km passed in 32:32, as Chepchirchir dropped back. By 15km (48:42) the field was down to just four - Kiplagat, Tadese, Tune and Arusei, with Tola drifting a few seconds behind and fading with every stride. About five minutes later the race became a showdown between Kiplagat and Tune. Tune, a profilic road racer who has run more than a dozen marathons, shadowed Kiplagat. Despite having run at or near the front throughout, the Kenyan clearly looked the stronger of the two. 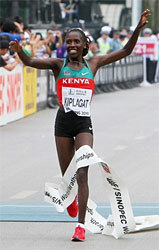 Shortly after the pair passed 20km in 1:05:06, Kiplagat began to pull away, to break the tape unchallenged. 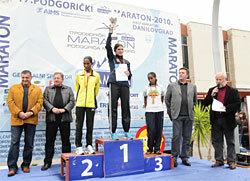 Tune was pleased with her first medal in international competition: “the conditions were not good, so I was happy with second” said the 2008 Boston Marathon winner. Arusei finished third to take her first international medal: “I tried three times for a medal and this was my day,” she said. A three-time winner of the Berlin 25K, at 31 Arusei was the veteran on the team. Her 23-second margin over Tadese was the key difference in the team battle. Teenager Chepkirui, who lagged behind in sixth for a large portion of the race, moved up a notch over the final kilometre to reach the line in just a second ahead of Ethiopian Mengistu. Both clocked career bests, as did Tola behind them. After an epic battle over the final two kilometres, Wilson Kiprop of Kenya upset Zersenay Tadese to take the men's title. Kiprop's victory was the first for Kenya at these championships since 2004, and ended Tadese's four-year reign at this event. “It's great to win, to beat a four-time world champion,” said 23-year-old Kiprop, whose breakout 2010 season also included the African 10,000m title at home in Nairobi. The knockout blow didn't come until the final 100m when Kiprop, running upright and looking forward, forged past Tadese, who appeared sluggish in the waning stages after running at or near the front since the outset. When he was passed a few strides from the finish Tadese came to a near-complete halt and hobbled across the finish in 1:00:11 reportedly injured. Just behind, Sammy Kitwara and Silas Kipruto secured Kenya's fifth straight men's team title. Kiprop, like Kiplagat, had run just one Half Marathon prior to Nanning, an impressive 59:39 debut also in Lille just one month ago. In Nanning he was the picture of experience as, along with teammates Kitwara and Kipruto, he kept the pressure on Tadese from behind. The men's contest was a bit more packed for the first half, with 15 men reaching 5km in 14:30. With Tadese at the front about a dozen were still in contention at 10km (28:49). The pace was considerably slower than in each of Tadese's previous victories but still well within reach of sub-one-hour territory. After another 2km the field was reduced to seven, then six. By 15km (42:49) only four were left – Tadese, Kipruto, Kitwara and Kiprop. Running side-by-side, they had built a seven-second cushion on Eritrean Samuel Tsegay and 12 on Kenyan Titus Masai. Moses Mosop, the fastest in the field this year, was 37 seconds behind the leaders at this point and well out of contention. With 48 minutes on the clock and the conditions taking their toll, Kipruto was the next to go, leaving the podium positions all but decided as the remaining trio passed the Nanning International Convention and Expo Centre. Two minutes later, it was just Tadese, still pushing at the front, and Kiprop, who was eyeing his adversary's every move. In their final approach towards the finish in the city's large central Wuxiang Square, Kiprop began to challenge the Eritrean, briefly moving to the front 53 minutes into the race. Tadese responded with his own surge, matched by Kiprop. Continuing to trade the lead over the final kilometre, Kiprop made his final effort with just over 100m to go. The team victory was never in doubt, with Kitwara and Kiprop closing in Kenya's scoring trio by fourth place. 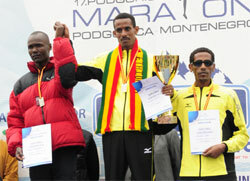 Eritrea, led by Tadese and Tsegay, took team silver for the sixth straight year. Lelisa Desisa and Birhanu Bekele crossed the line together in seventh and eighth, securing the second straight team bronze for Ethiopia. Surprisingly, given the favourable conditions (18°C) several of the top names in the men's race dropped out before halfway writes Mirko Javala. In the end there were only three runners fighting for the win with the rest of the field more than six minutes back. Leaders reached 5km in 15:14 and then went for the fastest 5km of the marathon (14:57) passing 10km mark in 30:11. Notably already at this stage several of the favourites had been dropped. 15km was passed in 45:26 and the leaders reached 20km in 60:46. The pace was still well under 2:10, but then slowed considerably, the next 10km taking 30:51. At 25km (1:16:17) there were seven athletes left and they kept together through 30km. Ethiopian Dejene Yirdaw made a move at 32km and opened up a nine second by 35km. Moroccan Abdellah Falil and Kenyan Kipchirchir Kimaly followed. Yirdaw held on to his small lead to win by 11 seconds. The women's race was won by 27-year-old Korean Chung Yun-Hee, who finished 16 minutes clear of her nearest rival. Getu Feleke set a sensational new course record with debutant Wilson Chebet 28 seconds behind him. Alice Timbilil won the women's race in 2.25.03. A record 31,463 entries were received for the race. Favourable weather and changes to the course made for a fast race. At 09.45 the Mayor of Amsterdam, Eberhard van der Laan, started 10,241 registered runners in the marathon. The leading group remained together for a long time, until Getu Feleke sped away at 35km. Chebet chased in vain, but broke the old course record by six seconds. Feleke's time was a 2 min 20 seconds inprovement on his personal best and moves him to eighth on the all-time list. The women's race was also decided late on, when Alice Timbilil also ran away from the group after 33km, finishing with the third fastest time ever run in Amsterdam and defeating last year's winner, Eyerusalem Kuma. The fast times mean Amsterdam has moved up one place in the top 10 fastest marathon races in the world and now occupies fifth place. Vincent Kiplagat and Ashu Kasim set new course records in mild, overcast conditions. Kiplagat led from the start from a group of Kenyan and Ethiopian runners, passing through 10km in 30:56 and halfway on 1:04:22. Approaching 35km Kiplagat surged ahead and passed 40km (2:03:04) with an unassailable lead. Alemitu Abera steered the women's race for the first hour, but Ashu Kasim led through halfway in 1:12:16 gradually stretching away from Alemitu Abera and Amane Gobena to finish nearly a minute inside the old course record. Gena Siraj of Ethiopia won a rain-lashed race by easing clear of 38-year old Gert Thys of South Africa in the final kilometre writes Pat Butcher. The dreadful conditions yielded one of the slowest winning times in the event's 30-year history. A light drizzle had already slicked the streets prior to the 08.00 start in a Tiananmen Square but minutes after the start, the heavy rain began followed 30 minutes later by a sharp drop in temperature. Thys was running "probably" his 40th marathon in a career that began at the age of 13. Pacemaker Matthew Sigei of Kenya stayed in the reckoning after his stint at the front, and came back from sixth place with 10km to run, to take third. The Chinese presumed to control the potential showers which might have ruined the Olympic opening ceremony two years ago, but truly bad weather is beyond any human aegis. The tail-end of a typhoon from the south east colliding with a cold front from the north-west left many of the competitors shivering and cramping even before they had finished. Last year's winner and race favourite, Sammy Mugo dropped off the pace at 35km. He said, “It wasn't too bad for the first 10km, but the temperature dropped, and with water splashing up I started to cramp”. Siraj won his breakthrough race in Rome earlier this year when, in tribute to fellow Ethiopian Abebe Bikila's barefoot Olympic win there 50 years before, took off his shoes with 50m to run and still won in 2:08:39. Former winner Chen Rong was a long-time leader in the women's race, with training partner Wang Jiali nowhere to be seen. But Wang closed her down at 35km and swept past to win by 15 seconds. Kenyan Simon Mukun won the first major marathon of his career at the 25th edition writes Diego Sampaolo. He broke his personal best to beat Sahle Betona Warga after a dramatic battle in the final kilometre run over the famous bridges. In the women's race Ethiopian Makda Harun Haji, fourth in 2009 in 2:29:56, also broke her PB clocking 2:28:08 to beat Elizabeth Chemweno. Pacemakers Mubarak Hassan Shami, Venice winner in 2005 and Paul Kimugul set a fast early pace to pass through halfway in 1:03:37 — a minute inside the course record. Migidio Bourifa and Danilo Goffi engaged their fight for the Italian Marathon title behind the lead group in the early stages of the race going through the 10 km mark in 30:04 and 15 km in 45:33. The leading pack featured these two leaders and Kenya's Paul Samoei Kimeli, Philemon Kemboi Kiprono, Peter Nderitu, Peter Some Kimeli, Simon Mukun and Ethiopians Tuyuba Beju, Sahle Betona Warga and Haile Diriba Demisse. Seven men remained in contention in the second half of the race. They still kept a 2:07 pace but the race became tactical in the more challenging second half of the race. Shami finished pacing at 30km (1:30:54). Goffi dropped out at 33km, leaving Italian title to Migidio Bourifa. On Freedom Bridge linking Mestre to Venice the battle hotted up. A trio comprising by Betona, Mukun and Peter Nderitu broke away. By 40km Makun and Betona were locked in battle over the 13 bridges. Betona seemed to have the edge over the final bridge but he fell with 400m to go, allowing Makun to take the win. The women's race set off at fast, with Kenyans Lydia Cheromei, Elizabeth Chemweno and Ethiopians Shuru Dulume Diriba and Makda Harun Haji leading through halfway in 1:12:56 at course record pace. Cheromei led narrowly through 30km (1:43:47) inside St. Giuliano's Park. At Freedom Bridge Haji and Chemweno broke away and at 40km Haji launched her attack and eventually won by 1:13. In their wake Elena Ruhliada came through the field for third place. Of 7000 registered runners 6253 of the 6519 starters finished the race, 997 of them women. Benjamin Kiptoo set a new course record. Wilson Kipsang became the eighth fastest runner ever, and the ninth Kenyan champion in succession by running 2:04:57 writes Pat Butcher. His time is the third fastest this year. Caroline Kilel improved her personal best by almost two minutes and led the first four women under the old course record. Frankfurt delivered its usual Sunday morning in late October, of ideal marathon conditions with the temperature hovering around 10°C and barely a breath of wind. By 15km, reached in 44:57, the pace was set for a sub-2:06 time. Kenyan and Ethiopian distance talent ensured it stayed that way right through to the red carpet-finish in the city's Festival Hall. The halfway split was 1:02:38, well inside the pre-race target. "I saw that we were going faster than the planned time for the half" said Kipsang, "I was happy.I knew I had prepared well and I felt good." Kipsang was confident enough to seize the initiative. Shortly after 30km (1:29:12), a group of six moved clear, with Kipsang keeping a close watch on Tadese Tola who had beaten him into third in Paris. "I couldn't let him build too much of a lead, so I stayed right behind." Kipsang had Tola's measure this time. A group of four reached 35km in 1:43:59, and 2km later Kipsang attacked and only Tola went with him. 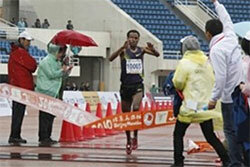 But the Ethiopian dropped further behind as Kipsang continued to run to victory in superb, relaxed style. The 28-year-old became the third fastest marathoner in the world this year with his win in 2:04:57, breaking the course record from last year by 1:17. Kipsang reaped a rich reward, his total payday amounting to 95,000 Euros. The defeated Tadese Tola still improved his personal best by 10 seconds and Elias Chelimo also ran a fine lifetime best in third. The winning performance was the tenth fastest of all-time. Caroline Kilel surprised herself confessing that only at 40km did she become confident of winning. "I thought that the Ethiopians would be stronger but I started to push, looked round and saw they did not respond." The pace in the women's race was always on target to break the five-year-old record of 2:25:12. Kilel was the one Kenyan to match the Ethiopian duo, reaching halfway with them in 1:10:59. Until 30km Caroline Kilel had a significant ally: husband Vincent, who paced her to that point. At 40km she turned the screw, leaving Dire Tune 10 seconds behind with the gap growing. 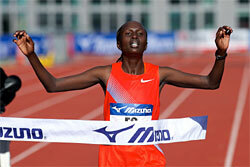 The defending champion, Agnes Kiprop of Kenya, was almost a minute behind. The 2500th anniversary of the Battle of Marathon has been a long time coming, but it took little over two hours for Paul Bett and Rasa Drazdauskaite to spring a surprise in the race, writes Pat Butcher. Both set new records in an event which was born out of legends surrounding that ancient battle. Drazdauskaite of Lithuania is a world class runner, but since she was competing in the concurrent World Military Championships, she was not listed in the elite entry. Master Sergeant Drazdauskaite blew her cover from the opening steps by shooting into an immediate lead. The 29 year old went further and further ahead on a bright sunny morning, to break the race record by over two minutes, finishing in the Panethenaiko, the atmospheric marble stadium built for the 1896 Olympics. It was Drazdausakaite's fourth marathon. Her fastest time is 2:30:29, set on a flat course in Frankfurt last year, but Marathon to Athens has a relentless uphill section from 10-31km and is rated as one of the toughest marathons around. "I wanted to run Frankfurt again (on the same day)", she said, "but the Army said I had to run here, and I'm glad now. I thought I had a chance, but I'm so happy to win this special race, with all the history". Bett, 26, had not been one of the pre-men's race favourites, but he was always in the leading group, which were paced through halfway in 65:49 in an attempt to break Stefano Baldini's record set in the 2004 Olympics. But when the pacemakers dropped out the group slowed in the glaring sunshine. Bett dropped the last of his opponents at 37km, to shave two seconds from Paul Lekuraa's 2008 record. His time was just half a minute slower than his fastest, 2:11:32, which came in Eindhoven, Netherlands last year. The course proved the undoing of several runners who were still in the lead group and well clear at 30km. Henryk Szost and Radoslav Gardzielewski of Poland were over two minutes down at halfway, but began to make inroads after 30km, catching them from 35km. Famous guests, including Stefano Baldini and fellow Olympic Gold medallists Joan Benoit-Samuelson, Rosa Mota and Constantina Dita, attended the celebrations surrounding the anniversary event.